Nancy M. West: Black Swans - A Novel Inspiration! Black Swans - A Novel Inspiration! 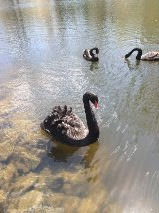 I was so excited to see not just one but an entire flock of black swans at a recent Garden Conservancy Tour (Judy & Michael Steinhardt Estate in Mount Kisco, New York) They are native to Australia. A black swan plays a central part in my current YA novel, and, quite honestly, I never expected to see one in the feather, so to speak! They are just as beautiful and graceful as white swans but perhaps a bit more mysterious and exotic. This one swam directly to me and posed. Did I mention that black swans are thought to be psychic? They are so beautiful. I hate to admit that I didn't even know there was such a thing as a black swan!!! You are welcome, and thank you for running my all time favorite blog! Combining mysteries and kitties is brilliant, and your Truffles is the purr...fect blog hostess! Many blessings!